If you’ve been reading LLB for a while now, you’ll notice I talk quite a bit about which products I use to calm, combat, and hide, my rosacea. Even though my skincare game is on point in keeping it at bay, it’s still sometimes visible, depending on the weather some days worse than others. When I do my makeup I don’t want to have to wear a ton of concealer (ps: see my review of my favorite, NARS Radiant Creamy Concealer, here) to hide the redness, so on days that aren’t so great I reach for my Givenchy Acti’me Color Correcting Primer in Acti Kiwi. 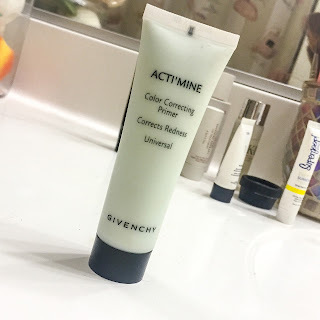 I used to be a huge fan of the Smashbox Photo Finish Color Correcting Primer (ps: read my review, here), which is still one of my faves, but when I saw this Givenchy Color Correcting Primer, I was really interested in giving it a try. The color of this redness corrector is a bit more minty looking compared to every other I’ve seen, which means it looks a bit more milky on the skin, which of course, looks sort of weird when applying. I try not to pat it in as much as I would a moisturizer, but more so intentionally target it around my red areas, and just gently press it into the skin. I look like I’ve used mint green blush after I apply, but as soon as I get started with my makeup it evens out and all redness disappears. It also helps my skin brighten up, sometimes the redness can make me look tired and dull, but the coloring of this primer helps to brighten up those dull spots. I’ve been really enjoying this primer, and I appreciate how well it covers my rosacea. This is my first Givenchy product and, not surprisingly, I’m impressed! The price tag is a little high, but I purchased this during the Sephora V.I.B. Rogue sale, so that justified it to me! There are a few other Acti’me Color Correcting Primers that target different skin concerns, as well as a universal brightening primer, so check those out too! Some mornings, if I’m in a rush, I need to be able to apply something quickly over my moisturizer that gives me a little bit of oomph, without a real “makeup routine”. You know, #teacherlife. 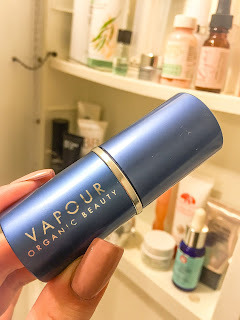 One of my favorite YouTuber’s, Esteé Lalonde, aka Essie Button, featured organic beauty brand Vapour in one of her haul videos, and I instantly checked out the brand. 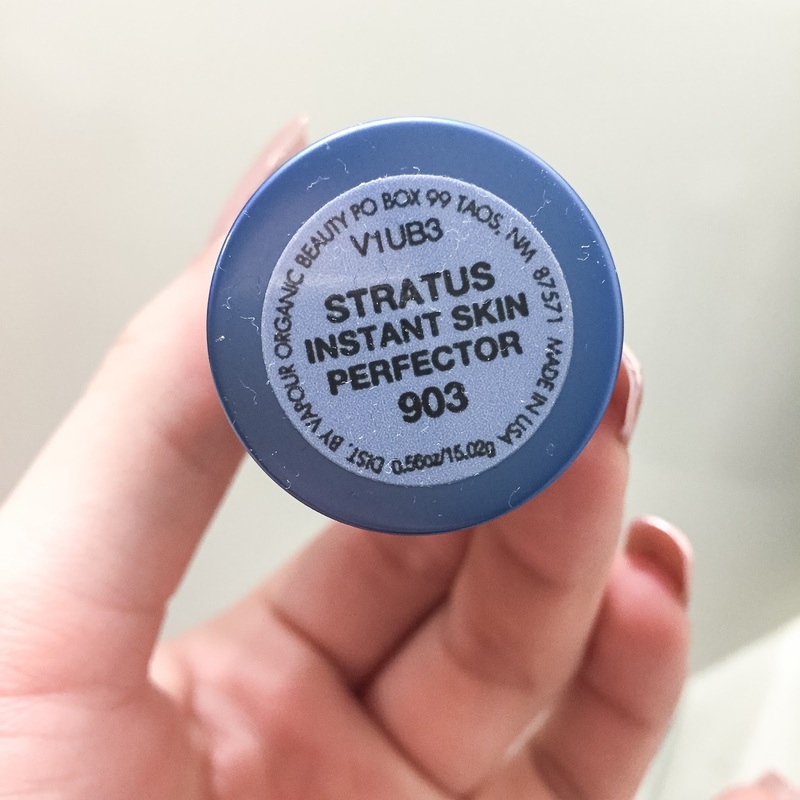 Esteé had featured their Stratus Luminous Instant Skin Perfector– essentially a primer, blur-er, & brightener in stick form. SO convenient, am I right? I had a Stratus Luminous Instant Skin Perfector at my doorstep a few weeks later, & I was so psyched to give it a try as I’ve been trying to incorporate more organic products into my daily routine. After going through my morning routine I swipe the stick all over my face & blend it with my fingers a bit, concentrating on areas that need a little more coverage than others. My skin looks refreshed, bright, and some trouble spots, most often my chin area, look more even and less bothered. I simply apply some concealer under my eyes, around my nose, and again, on those troubling spots…and I’m done. That’s it. Can you tell it’s been well loved? All of this happens in under 3 minutes. I swipe some mascara on my lashes, & we’re good to go. As a primer this product really does create a nice canvas for whatever makeup you want to apply. The use of the stick was interesting at first, I was worried about pulling on my skin, but after a few tries I was able to apply the Instant Skin Perfector easily. The blending with my fingertips, especially around those problem areas I mentioned, was a nice alternative to how I typically apply primer. As more and more women make the switch to organic beauty products it’s important we have brands we can trust. After my continual use of the Stratus Luminous Instant Skin Perfector I’m looking forward to adding some more Vapour Organic Beauty products to my routines. Have you started adding more organic products to your beauty routine? My first thought when receiving this product was, what is a blur perfector? My second thought when receiving this product was, yay I love YSL! The purpose of the Yves Saint Laurent’s Touche Eclat Blur Perfector is to create a perfectly smooth, fine line free, pore minimized canvas for makeup. I would describe its texture as balm-ly like, it applies the way a balm feels, yet kind of turns to powder as the after effect and feeling. I hope that made sense! I look at this product as a primer, and a good one at that. For the past three weeks I’ve subbed in Yves Saint Laurent’s Touche Eclat Blur Perfector for my typical primer, and I’ve had great results. The best part of this product for me, is the fact that it’s mattifying…my ultimate test. As far as the color goes, it has a nice rose color in the palette that blends in easily to any skin tone color. Not only can you use this product as a primer, but you can use it as a touch up throughout the day. & let me tell you something, having this in my makeup bag on these hot and muggy D.C. summer days, has been amazing. I use the applicator that came with the Blur Perfector and just blot on the oily parts of my face…it instantly creates a more matte look and evens out my foundation. 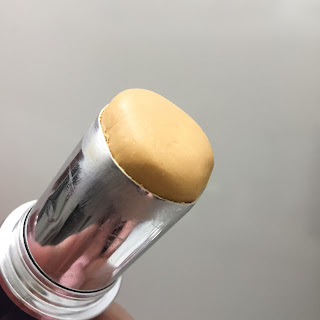 I wish there was a bit more substance to the applicator, especially since the formula and texture of the product changes, but we all know the applicators products come with aren’t the best. I know looking at the price tag of the Yves Saint Laurent’s Touche Eclat Blur Perfector might cause people to think twice before purchasing, but the truth is this is such a multifunctional product, that I feel as though its many uses allow the cost to make sense. Also, it’s YSL. Disclaimer: I received this product through Influenster. All opinions are my own. I’ve recently gone on a primer binge. I used to not apply primer before work in the morning…well, more like some days I would (i.e. if I was going out after work) & others I wouldn’t. I apply my makeup around 6:30am and my day ends around 5:30pm…seriously, my makeup wasn’t cutting it for 11 hours. 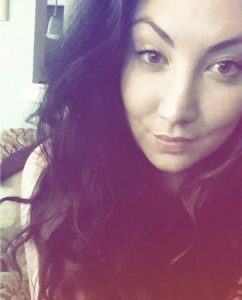 Between the temperature of my classroom, doing 500 things in the span of 7 hours, and not always hydrating as much as I should be I felt like I looked like a mess by 5pm- it didn’t even look like I had any makeup on. My solution? Purchasing a high quality primer. I’m really into color correcting products since I have rosacea, so I figured I’d give the Smashbox Photo Finish Color Correcting Foundation Primer a try. I have used the standard Photo Finish Primer before, so I already knew it was a great product. I was hoping the Color Correcting Primer would give me just a bit more oomph and conceal any redness. The first rule with this product, and any primer, but I really notice it with this one…is to let your moisturizer/ eye cream completely dry before applying it. The primer won’t stick and it’ll feel kinda wet/ slippery if you try to apply it over skincare products that haven’t completely set yet. As far as the color correcting aspect, I expected more. It did tone down redness a little bit, but I had much higher expectations. After using this primer my makeup applied super smooth and even. Although I’m bummed out about the lack of color correcting this Smashbox Primer does, I am impressed with its ability to allow makeup to last all day without feeling like it slid off my face. I can’t speak to the other colored Smashbox Foundation Primers working the way they claim to, but I do know that overall the Smashbox Foundation Primer line is amazing at doing it’s primary job, creating a great canvas to helping makeup last.